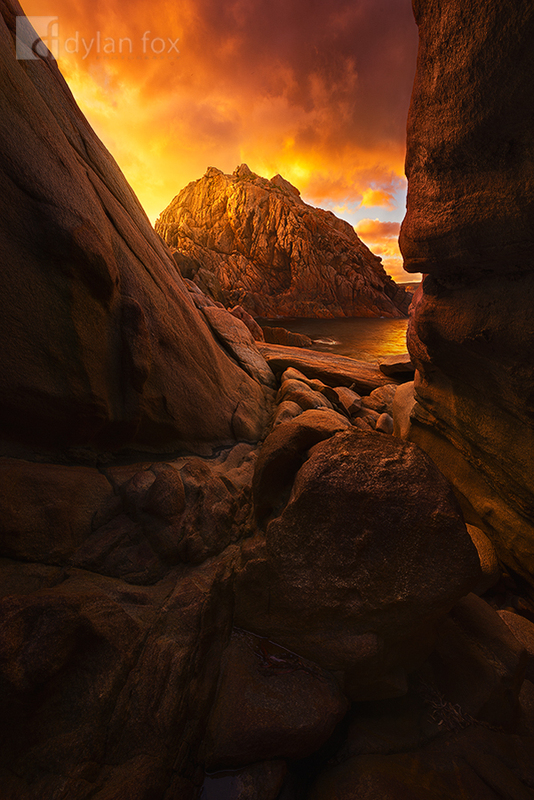 This particular day, I made the 3 hour drive to photograph Sugarloaf Rock, a place I have been many times before. I wanted to explore different area around its rocky coastline and capture a find a composition that was unique and gave a different perspective of this well know West Australian location. I had been watching weather maps for a couple days prior and it looked promising for some good evening light. I arrive a few hours before sunset to scout around and during that time there were clouds in every direction except where I wanted them... above Sugarloaf. I got lucky. Right as the light was peaking these clouds drifted over from behind me and lit up with colour. They were moving quickly so I didn't have long to make the most of them. It was nice then making the 3 hour drive home knowing I had come back with what I set out to achieve. Secure your limited edition, Sugarloaf Rock photographic print, 'Looking Out', by selecting your desired print size in the menu to the right.